Anya’s Ghost is a graphic novel about a Russian girl that goes by Anya Brozakovskaya. One day while wallowing in self pity, she falls down an abandoned well and falls upon a ghost named Sarah. Later, after getting out of the well, Anya is constantly being stalked by this ghost who is seemingly innocent, but looks can be deceiving. I really enjoyed this book. I really liked the art work. The storyline was also really fun (but not scary, even though it’s a ghost story). It was interesting to watch Anya change during the book because of all the things Sarah does. Overall, I found this book really fun and a good summer read. I’d recommend Anya’s Ghost to a teen audience. It does have some mature things in it, but nothing too bad. Eden West follows the story of Jacob, a seventeen year old boy, living in the isolated paradise of Nodd. Nodd is a world within a world, a secluded land that protects its members from the evils of the world. Jacob has grown up in Nodd his entire life, surrounded by green pastures and faith that the Angel, Zerachiel will come to save him and the people of Nodd. However in the year following Jacob’s seventeenth birthday, he is tempted by a beautiful girl, Lynna, from the outside world. As Jacob becomes further involved with Lynna, things in Nodd begin to fall apart and so does Jacob’s faith and allegiance to his community. Max Kilgore’s name sounds like something out of the latest action blockbuster, but his personality is the total opposite. His passion for dinosaurs and crossword puzzles, along with a really bad haircut, put him at the bottom of the food chain, and with a squeaky clean record Max is the epitome of a “good kid”. So imagine his surprise when one day, after digging for fossils on his local hill, he opens up a hole straight into hell. Now he has to deal with Satan (who has a passion for Doritos and Call of Duty) while taking care of his terminally ill mother. Reading Corps is back in action! We’re back with new reviews, so stay tuned for some awesome summer reading recommendations. This summer has been incredibly busy for me but nevertheless I had time to watch an anime that was highly recommended by a friend of mine. 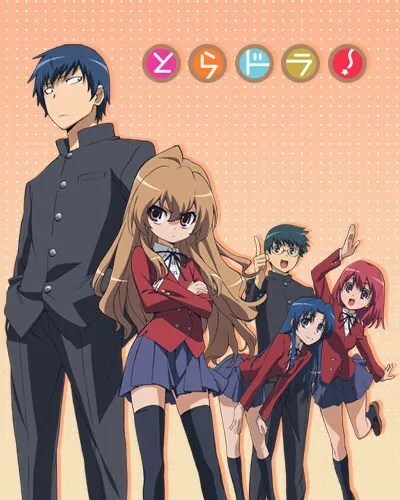 It took some doing, since I generally try to avoid romantic slice of life shows, but he eventually got me to watch it and I found that I really enjoyed Toradora, and you should see it too! Our Poetry Contest is Almost Over! Only two days left to submit your poems! Refill your coffee, break out your rough draft, and polish up those final versions: the end of the contest is almost here! My New Year’s resolution? To be able to bench press 50 pounds by the end of January. I don’t think this is something that would happen by itself, but I don’t perceive it as to unfeasible to accomplish. For me, it’s a perfect goal. I asked several of my friends what their goals were and all of them fit somewhere in the top ten “teen” resolutions (listed above). I think that all of these are fine New Year’s goals, but they are objectives that I strive to accomplish on a daily bases, not especially in a New Year.